You Just Signed A Construction Contract That’s In Excess of Your Limited General Contractor’s License; Can You Still Compel The Owner To Pay You? Yes, but only up to a point. Specifically, once the statutory limit of the license is reached, no additional contract balance above that limit may be recovered. 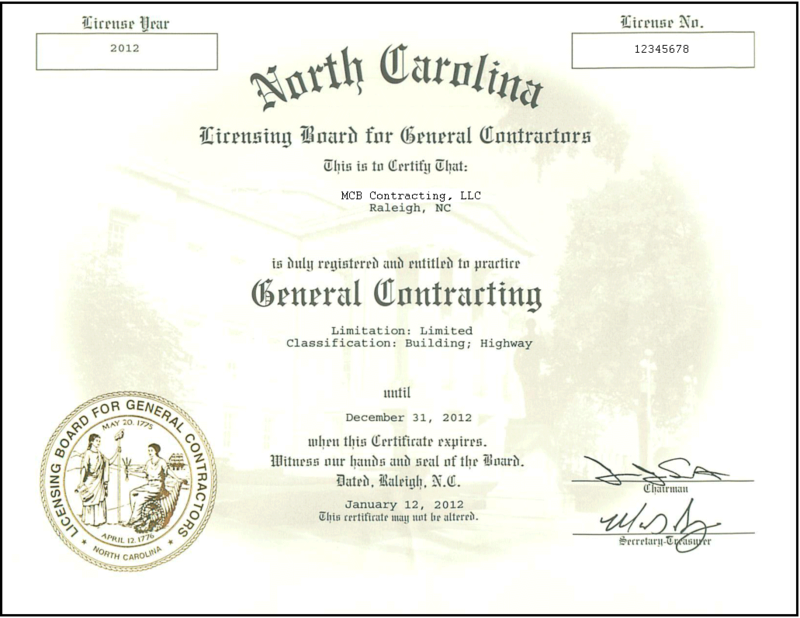 Our analysis begins with the N.C. General Statutes, specifically Chapter 87-10, which states, in pertinent part, that “the holder of a limited license shall be entitled to act as general contractor for any single project with a value of up to five hundred thousand dollars ($500,000)[. ]” We also need to bear in mind that in 1983, the North Carolina Supreme Court adopted the rule that “a contract illegally entered into by an unlicensed general construction contractor is unenforceable by the contractor. It cannot be validated by the contractor’s subsequent procurement of a license.” Brady v. Fulghum, 309 N.C. 580, 586, 308 S.E.2d 327, 331 (1983). Based solely on the cited language of Chapter 87-10 and the general rule expressed in the Brady decision, it would be tempting to conclude that a contract entered into in excess of the statutory limit is illegal, void and therefore unenforceable in a court of law as of the moment the contract is signed. Fortunately, however, that is not how subsequent appellate decisions have handled the situation. In Sample v. Morgan, a contractor with a $125,000 limited license (that was the statutory limit back in the early ’80’s) entered into a construction contract for $115,967.81, and subsequently entered into change orders with the owner that brought the final construction cost to about $130,000, or $5,000 greater than the limited license. The N.C. Supreme Court held that “until [contractor] exceeded the allowable limit of his license, he was not acting in violation of G.S. [Section] 87-10.” 311 N.C. 717, 723, 319 S.E.2d 607, 611 (1984). Similarly, in Dellinger v. Michal, the contractor was licensed up to $175,000 (the statutory limit in the mid ’80’s) when the contract was executed. Two months later, it secured an unlimited license. Construction began just before the licensure upgrade, and the contractor had only performed $2,800 in work before its license became unlimited. Ruling that general contractors are only entitled to recover up to that amount authorized by their limited licenses, the N.C. Court of Appeals (“COA”) permitted the contractor to seek payment for its work, since the value of the work it had performed had never exceeded the limit of its license. 92 N.C. App. 744, 375 S.E.2d 698 (1989). The Dellinger rule was upheld by the COA on March 20, 2012 in the unpublished decision McK Enterprises, LLC v. Levi. In that case, the contractor’s limited license permitted it to perform work up to $350,000, but the contract it entered into with the owners was for the lump sum price of $439,141.43. When the bank that was financing the project discovered the issue, it required the owners to sign an acknowledgment that the contract price exceeded the contractor’s license. The contractor and the owners then entered into a modified contract that was identical to the first, except the cost-risk framework was changed from lump-sum to cost-plus (with a 15% fee). As the COA noted, both parties anticipated at the time this modified contract was executed that total costs would exceed the limit of the contractor’s license. As of the end of September 2007, the contractor had performed work valued at $219,581.82 — well within its $350,000 single project limit. On October 1, 2007, an amendment to Section 87-10 of the General Statutes went into effect, increasing the contractor’s $350,000 limit to $500,000 (the current limit). The final value of contractor’s work was $505,269.12, or about $5,000 more than the amended limit to the contractor’s license. Relying on the rule in Dellinger, the COA held that the contractor was entitled to recover $500,000, but couldn’t recover the rest. The takeaway? If you sign a contract in excess of your limited general contractor’s license, the courts are not likely to consider it illegal, void and/or unenforceable from Day 1, meaning you can force an owner to pay you for your work, at least to a point. That’s the good news. Now the bad: once you hit the current $500,000 limit, the courts are not likely to allow you to recover a penny more. McK Enterprises, LLC lucked out when the General Assembly increased the then-existing license limit from $350,000 to $500,000 during the project, but you can’t rely on that kind of good fortune when you sign on the dotted line. The far more prudent course is to execute contracts within your limit. If you do otherwise, you’ll either need to upgrade to an unlimited license before hitting the statutory ceiling or hope for a limit increase by the state legislature in order to collect anything in excess of your current limitation.